Don't forget to join us, here at All Things Anderson, when we live blog during Anderson's NYE broadcast. The program begins at 11PM Eastern, we hope you'll join us for the festivities. 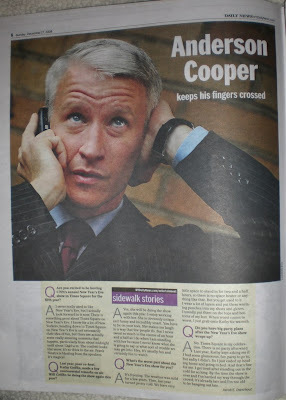 Julie found this interview posted on Flickr from last Sunday's New York Daily News. In it AC talks about doing the NYE program from Times Square, Kathy Griffin, what he does to keep warm during the broadcast and that there are no after parties for him. To read the details just click to enlarge. This is a cute photo of AC before he lost his second watch. I especially liked the part where he "grabs Kathy to keep him warm." I'm not a fan of hers, so at least she's good for something. Have a fun chat ladies.